An irregular heartbeat can be a very common symptom of menopause, because hormone levels fluctuate during this transition. 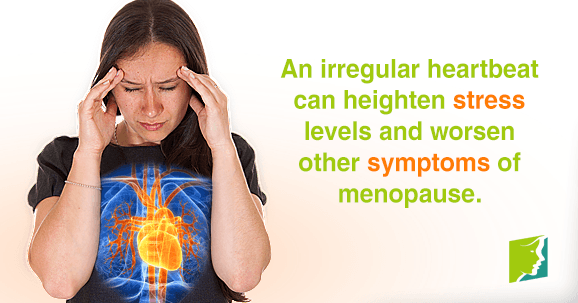 Estrogen, in particular, has a significant impact upon the cardiovascular system, so the shifts in its levels are the typical cause of an irregular heartbeat during menopause. Overactive thyroid. This will also be accompanied by other symptoms such as mood swings, diarrhea, and hyperactivity. Anemia. Hair loss, itchy skin, and headaches will usually accompany this condition. Dehydration. Dehydration is associated with tiredness, a dry mouth, and concentrated urine. If you are concerned that your irregular heartbeat is a symptom of another condition, then you should consult a medical practitioner. An irregular heartbeat does not just have an effect upon your physical health; it can also present dangers to your emotional and mental health as well. Suffering from an irregular heartbeat can heighten stress levels. Stress itself heightens your risk of suffering from an irregular heartbeat, so it can become a vicious circle. Heightened stress, anxiety, and panic can lead to panic attacks, which cause heart palpitations as well as nausea and fear, symptoms that have been known to be confused for heart attacks. What Can You Do about an Irregular Heartbeat? Despite an irregular heartbeat not being dangerous the majority of the time, it is worth avoiding lifestyle habits that could trigger them. Try to cut down on caffeine and alcohol, as well as rich, spicy foods. Smoking or the use of recreational drugs can easily exacerbate the problem, as well as precipitating more dangerous conditions. Maintaining a regular exercise regime will work toward keeping your heartbeat steady and will improve your overall health at the same time. Fortunately, irregular heartbeats during menopause are usually caused by hormonal imbalances and present no danger. However, if you are experiencing irregular heartbeats regularly, if they are accompanied by dizziness or shortness of breath, or if you are concerned about your symptoms, then it is best to consult with a physician. Click on the following link for further information on how to manage irregular heartbeats. Ever find that your heart skips a beat? Could it be more than a sign of love? Learn more about the menopause symptom here. When a menopausal woman is stressed, hormone changes mean the body and its heart can become more susceptible to serious illness.